Product ID#6748. Lead Time: 3 Weeks! *Important Shipping Regulation Due to DOT shipping regulation, this battery pack is not pre-assembled and will be shipped in several boxes. For 20Ah, 4 pcs BMS-4SB20-V2 is installed to maintain balance voltage of each cell. 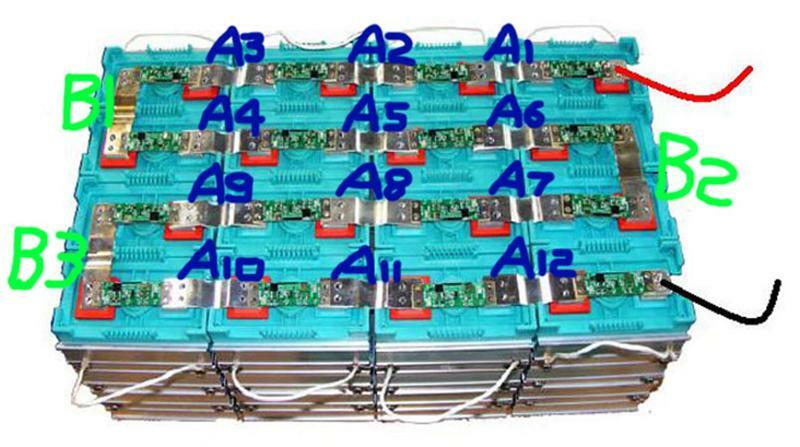 For 40Ah/ 60Ah/ 100Ah, 4 pcs BMS-EL-V7 is installed to maintain balance voltage of each cell. Green LED On: "Finish Balancing / Ready to discharge"
Red LED On: "Operate Balancing"
Note International Customers: Due to the high shipping cost , we are sorry we do not issue warranty, return or refund for this item. You are buying at your own risk. There are 4 modules in this package, the final dimension depends on how you organize those modules. Total Shipping Weight: include batteries, charger and BMS This combo is not pre-assembled and will be shipped in several boxes. To keep battery for longer cycle-life with the best balancing function, we recommend customer to charge battery while discharging. 48V LiFePO4 Prismatic battery pack shall be cut-off at 60.8V during charging and 40.0V during discharging. If over discharge to 40V (2.5V/cell), please recharge the pack right away. Otherwise the battery is over discharge and cannot recover! International Customers: Due to the high shipping cost , we are sorry we do not issue warranty, return or refund for this item. You are buying at your own risk. Please choose to add a relay (Over discharge protection) to this package or purchase a relay yourself. Please choose a 12V battery to power BMS and relay.